Craig Kieswetter and Jos Buttler helped England round off their summer in style with a 28-run win over South Africa to draw the Twenty20 series 1-1. 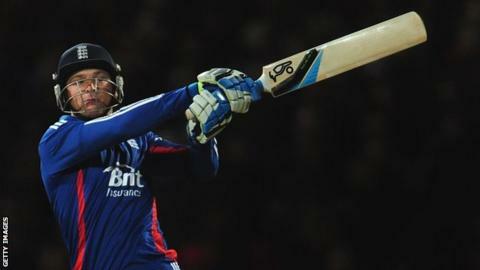 Kieswetter smashed 50 off 32 balls and Buttler an unbeaten 32 off 10 as England posted 118-5 at Edgbaston in a match reduced to 11 overs by rain. Both players hit three sixes, while one Wayne Parnell over went for 32 runs. South Africa never looked like reaching their target, losing regular wickets as they were restricted to 90-5. England's thrilling performance saw them usurp South Africa at the top of the International Cricket Council rankings, and sends them to Sri Lanka for the defence of their World Twenty20 title in confident mood. They were ruthless with the bat, canny with the ball and energetic in the field to the delight of an exuberant crowd on a damp and chilly evening in Birmingham. When Buttler joined Kieswetter, England were 64-3 with only 16 balls remaining, but a brutal display of power hitting from the Somerset pair transformed the complexion of the innings. Kieswetter, reprieved by a missed stumping by AB de Villiers on 31, lit the fuse by smashing spinner Johan Botha back over his head for six. Buttler, who had scored just 36 runs in 10 international Twenty20s before this game, served notice of his talent with an incredible assault, hitting Parnell for two straight sixes and twice scooping the ball over his shoulder for four. Two no-balls, another six over midwicket and a pair of twos rounded off the second most expensive over in Twenty20 international history, behind Yuvraj Singh's six sixes off Broad in the inaugural World Twenty20 in 2007. Kieswetter and Jonny Bairstow both fell to Morne Morkel in the last over, but England still managed to pick up 12 runs from it to post a total that would not be far off a competitive 20-over score. South Africa's innings followed a similar trajectory to England's but lacked the catalyst provided by Buttler's brilliant cameo. After Richard Levi, Faf du Plessis and De Villiers fell in single figures, Hashim Amla took up the chase with six fours. But when he was caught at deep midwicket by Bairstow for 36 to give Graeme Swann his second wicket, South Africa needed 65 runs off 24 balls. Despite some lusty late blows from Albie Morkel and Justin Ontong, South Africa fell well short. Like Swann, Tim Bresnan finished with two wickets, Hampshire spinner Danny Briggs took one on his Twenty20 international debut and Jade Dernbach gave up just 14 runs from his two-over spell. England fly to Sri Lanka on Thursday and will play warm-up matches against Pakistan and Australia before their first group game against Afghanistan on 21 September.